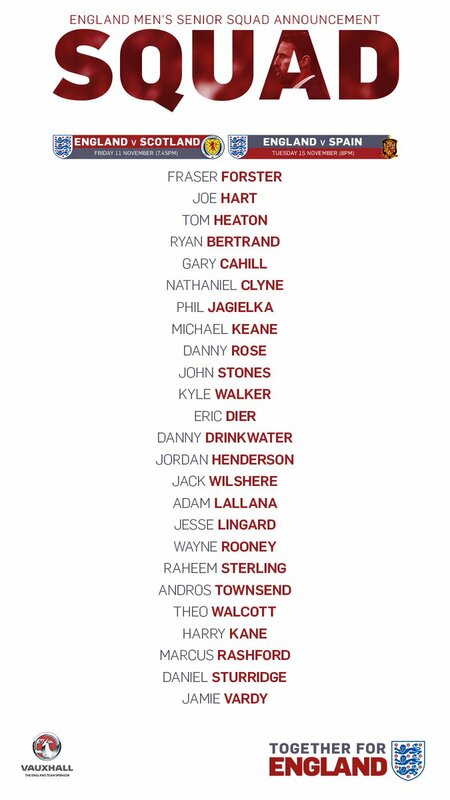 Jack Wilshere and Harry Kane have returned to the England squad for their upcoming games against Scotland and Spain. Wilshere left Arsenal in the summer in search of regular first team football after being left out of the England squad and the midfielder secured a loan move to Bourenmouth on deadline day. The 24-year-old has been enjoying life under Eddie Howe on the south coast and has done enough to convince Gareth Southgate to recall him to his England squad. Kane returned to the Tottenham starting eleven today following six weeks out with an ankle injury and scored during a 1-1 draw at Arsenal this afternoon, and the striker has also returned to the England setup. Liverpool midfielder Adam Lallana is named in the squad after missing out last month through injury and he’s included along with team mates Nathaniel Clyne, Jordan Henderson and Daniel Sturridge. Manchester United skipper Wayne Rooney is once again named in the squad and is joined by team mates Jesse Lingard and Marcus Rashford while Leicester City’s Danny Drinkwater gets a recall. However, Alex Oxlade-Chamberlain has been axed along with West Ham’s Michail Antonio as Southgate prepares to take on Scotland in their latest World Cup qualifier next Friday before taking on Spain in a friendly the following Tuesday.